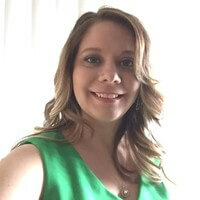 "I have truly enjoyed using Planning Pod to keep my event planning to-do list in one central location, which definitely makes it easier for me to stay on track. I especially like the event planning templates that allow me to set up an event and load in all my tasks without starting from scratch each time!" Track event to-dos related to managing staff, vendors, venues, volunteers, budgeting, payments, marketing, entertainment, speakers, setup/teardown and more. Add descriptions, due dates, notes, task status and file attachments. Assign to contacts and sublists. Always know where you stand with your upcoming, due or overdue tasks with at-a-glance event dashboards. All event tasks are displayed by due date on our master events calendar, which you can sync with any other electronic calendar (Google, Apple, Outlook, etc.). Our event planning checklist tool lets you assign tasks to contacts (staff, vendors, volunteers, etc.) and filter tasks by who they are assigned to. Also set email or text message reminders so assigned contacts receive notifications prior to the item due date and on the due date. Create your own event planning templates for task lists you use repeatedly. Or use our prebuilt templates for banquets, conferences, fundraisers, meetings, parties, weddings, more. When you add a template to an event, all item due dates are automatically backed out from the event date. Download branded PDFs of your event planning checklists. Our event management software is cloud-based and mobile-friendly, so you can access and manage your timelines anytime, anywhere, on any device - smartphones, tablets, laptops and desktops. 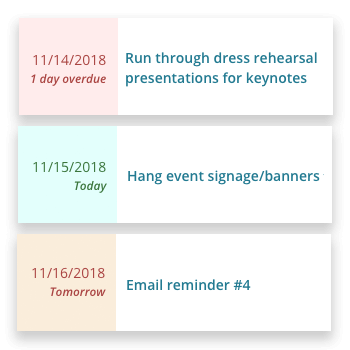 Create event to-dos with due dates, descriptions and notes and assign them to staff, team members, vendors, committee members, volunteers, etc. Start with our prebuilt event planning templates to save lots of time. Or create your own templates from scratch or by importing them from a spreadsheet. Sort your to-dos for each event into sublists for easier management of tasks. Use the search feature to search for words/phrases or use filters to view tasks by assigned contact. Attach documents, images and other types of files related to a to-do so assignees can refer to it when completing the task. Set email and/or text reminders for each to-do to notify assigned contacts ahead of time as well as on the due date of the task. Our event planning checklist tool integrates with our calendar tool to display to-dos on their due dates. And you can sync our calendar with other e-calendars to view your to-dos there. Use our home page and event dashboards to view upcoming, overdue and recently completed tasks as well as quickly edit them or mark them as complete. Download a branded PDF document of your event planning checklist in a single click. Customize what tasks are included by running filters or selecting due date time ranges. One of the most important tasks in making sure that your events run smoothly is actually creating a thorough event planning checklist or task list that covers every important to-do and responsibility leading up to, including and after your event day. Event task lists are not only a checklist but also a planning timeline and measure of progress of what has and hasn’t been done and what needs to be completed before your event arrives. Most event checklists should detail planning activities at least 4-6 months before your event date (as that’s probably the latest you should wait to book a venue), but if you have a larger, more involved event (like a big conference or trade show) you should probably be scheduling tasks 12-18 months prior to the event date. An event checklist is an essential part of any event project management plan, and it’s a great asset to have for managing logistics for events both small and large, including planning weddings and parties; hosting fundraisers and non-profit galas; organizing corporate events; managing meetings, conferences and conventions; and setting up ceremonies, dinners, festivals, product launches, focus groups, training, retreats and tournaments. Most seasoned event professionals have one or more event planning templates that they use and customize for each event, saving them a lot of time. But if you don’t have one there are many event planning checklist templates and event management template examples available online that you can download and use as a starting point. If you are creating an event planning worksheet or checklist from scratch, or if you simply want to make sure that you have included all the important items on your list that you need to attend to as you manage your event, here is a list of 56 critical items that you should consider adding to your pre and post event planning checklists. NOTE: Under each topic, we are listing all the separate tasks or to-dos you may want to add to your event planning checklist, as each item may require separate tasks devoted to brainstorming, planning, selection, setup, followup, etc. Set up accounting software, collect receipts, track financials and financial milestones. Brainstorm advertising strategies, research vendors, review quotes, write/design ads, make ad placements and review performance. Build a thorough day-of agenda or run sheet for your event, make updates regularly and distribute it to staff, vendors, volunteers, etc., prior to the event. Identify target audience, set expected attendance, create and manage attendee guest lists, designate marketing/communication channels and tactics, track headcounts and report headcounts to vendors (venues, caterers, etc.). Identify A/V needs (lighting, sound, video, staging, production), research vendors, review quotes, negotiate fees, sign contracts and arrange setup. Identify awards (plaques, trophies, gift bags, etc.) and recipients, budget for items, order/fabricate items and ship/deliver items. Build blog or add it to website, create posting schedule, make writing assignments, post articles and promote articles on social media. Arrange for designer, create logo/color palette and distribute to team for use in marketing materials. Build out initial budget, make adjustments, acquire approvals, collect vendor quotes, negotiate fees, set up payment schedule and make payments on time. Identify food and beverage needs, create and assess catering program and draft menu(s), estimate headcount, research catering vendors, schedule tastings, negotiate fees, select vendor, select menu, retain proper licensing (alcohol, etc.) and arrange for setup. Determine check-in process and equipment needs, procure necessary check-in software, equipment and rentals (computers, tablets, tables, etc. ), set up cash box, confirm necessary staffing and set up at venue. Determine oversight needs, set up committee structure, recruit committee chairpersons, set committee responsibilities, recruit committee members, set meeting schedules and establish reporting criteria. Brainstorm event theme, select preferred theme, identify and recruit content creators and presenters, develop scripts and approve scripts. Identify contracts to be drawn up, secure legal council for contract creation, customize and send out contracts to suppliers/vendors and acquire signatures. Brainstorm potential event dates and times, select preferred date/time and back out all tasks on event planning checklist from event date. Set post-event meeting to assess lessons learned and create summary document for next event. Secure designer and contractors (floral, etc. ), brainstorm on design look-and-feel, determine items to be designed (posters, flyers, mailers, signage, etc. ), set design and printing deadlines for each item and deliver/set up items at on event day. Determine email needs, select email marketing software, create event email template, schedule email blasts (email invitations, reminders, updates, etc.) and write/design/send emails. Determine entertainment needs, assess type of entertainment required, research entertainers, review demo reels, negotiate fees/terms, select entertainment, consult regarding performance/playlist, acquire music permits/licensing and set up at event. Determine website scope, contract with developer or event website maker, design site, write and build out web pages, launch site and add relevant updates at benchmark dates. Identify exhibitor audience, determine exhibit offerings and fees, create sales sheets, train sales staff, acquire/build sales list, contact prospects, collect signed agreements, invoice and collect payments and provide event dat setup instructions. For post-event feedback, script questions, determine survey software, build out survey, email survey link and analyze results. Brainstorm on event purpose, theme, audience, budget, location and dates; narrow down preferences and survey stakeholders and target audience; and make decisions based on input. Assess what insurance and coverage (if any) should be purchased, research with providers, purchase best options and inform parties that require insurance coverage (venues, etc.). For invoicing sponsors, exhibitors, donors, etc., procure accounting and event payments system, set up invoice drafts/templates, create and send out invoices and follow up on payments. Create CRM database of leads (sponsors, exhibitors, donors, VIPs, media, etc. ), establish deadlines and milestones, reach out to contacts, record interactions and track conversions. Set deadline for writing/design/printing of materials to be mailed, set budget for postage and assembly, select and contract with mail house for assembly and set mail drop dates. Determine best methods for reaching target audience, create marketing plan, set deliverable and launch dates for items, contract with writers/developers/designers and set up review process. Develop list for name badges, purchase name badge stock/holders/lanyards, print badges, assemble badges and set up at event. Identify parking providers near venue, acquire quotes, negotiate with and select vendors, communicate with attendees, create parking directional signage and confirm with providers prior to event. Determine what permits (if any) are required, research permitting process and fees, apply for permits/licenses and communicate with relevant parties that require permits. Assess photography and/or videography needs, research providers and view portfolios, negotiate with and select providers, set objectives/guidelines and set up at event. Set date for completion of writing/design/production, attend press checks, ship/distribute printed pieces to appropriate locations/vendors and set up at event. Determine event project management needs, identify and select managers, procure event project management software tools and set up assignments and milestones. Identify appropriate media outlets and members and create list, build media outreach timelines, draft/send out press releases and follow up with media members. Brainstorm on backup measures/sites in case of rain, arrange with appropriate vendors and confirm with them the week prior to event. Determine ticket offerings/pricing/packages/discounts, select event registration service, build event registration website and webform, set timeline for registrations, set registration launch date, monitor registrations and email updates/reminders to registrants. Identify rental needs (equipment, tables, chairs, linens, etc. ), research providers, obtain quotes, negotiate with and select suppliers, follow up with suppliers prior to event and monitor set up at event. Assess what areas require seating charts and setup diagrams (assigned seating, banquet dining, auditorium layout, etc. ), contract with designer or acquire event floor plan software, configure layouts, distribute to staff/vendors/etc. and print out prior to event. Establish security requirements (perimeter, crowd control, fire/EMT, etc. ), research/interview/hire providers (if necessary), create safety plan and conduct walkthrough at event with security staff. Determine all items that require setup (check-in/registration desk, rentals, exhibits, A/V, rentals, etc. ), add setup times to day-of agenda / run sheet, distribute to staff and vendors and monitor set up of all items at event. Identify items that require shipping or delivery (printed materials, rentals, booths, etc. ), research and retain shipping providers, schedule ship dates, package and prepare for shipment, arrange for on-site drayage at venue and monitor on site. Set up appropriate social media accounts (Facebook, Twitter, Yelp, LinkedIn, etc. ), create event hashtags, assign and invite staff in charge and create posting schedule with topics. Assess speaker/presenter needs, develop theme/topic needs, develop speaker/presenter list, contact/negotiate/select speakers, draft scripts, review/finalize scripts, arrange for travel/lodging/honorariums, confirm with speakers prior to event and conduct dry run prior to event. Identify sponsorship/revenue needs, create sponsorship packages, build prospective sponsor list, reach out to sponsors, send proposals, invoice and collect payments and offer white-glove service at event. Identify staffing needs, create roles/responsibilities (finance, marketing, sales, project management, content, on-site staffing, etc. ), identify and assign staff members appropriately, set up staff oversight/management, make travel and lodging arrangements and conduct walkthrough with staff on site. Determine staffing and cleaning needs, consult with venue on teardown/cleaning requirements, identify or hire appropriate staff and manage teardown. Design and send out post-event thank-yous to staff, committees, vendors, sponsors, exhibitors and volunteers. Identify transportation needs (from airports and transportation hubs, on-site, etc. ), research/interview/hire vendors, delineate transportation routes and assignments and monitor suppliers at event. Assess travel and lodging needs for staff and speakers, assess lodging needs for attendees, research lodging providers, obtain quotes, conduct walkthroughs, establish minimums, negotiate with and select lodging providers, monitor bookings and follow up prior to event. Identify external vendor/supplier needs, identify vendor management solutions/apps, create needs list, develop prospective suppliers list, create RFPs for suppliers, acquire quotes/proposals and conduct interviews/visits. Assess venue requirements, research venue options, draw up and send out venue RFPs, receive proposals, schedule and conduct venue site visits, conduct negotiations, select venue, sign contract, work with venue point-of-contact and conduct final walkthrough prior to event. Identify video needs (for marketing, day-of content, etc. ), research production companies, draw up and send out RFP, receive proposals, select vendor, draft and approve scripts, shoot video, set deadline for post-production and completion, and prepare video for distribution/viewing. Define VIP audience purpose and experience, create VIP list, invite and/or recruit VIPs, plan at-event VIP experience, communicate with updates and execute plan at event. Define volunteer needs and roles/responsibilities, create volunteer list, reach out to and recruit volunteers, assign volunteers to roles, train volunteers, send updates/confirmations prior to event and conduct at-event walkthroughs. Assess waste management needs, contract with appropriate vendors (if needed), coordinate with venue regarding waste management vendor and sustainability practices and oversee setup at event.